Customized balloons are kid's favorite and are perfect to gift whenever you greet them the next time. Most kids enjoy having balloons as their toys and themes for celebrations. This means you are going to hit with them by giving away balloons printed with your brand logo and message. After giving away these balloons you will realize that you have a cost effective promotional tool that offers huge returns at a small investment. Shop today at Promo4kids.com and avail the benefits of competitive prices and huge discounts on bulk orders! Our lowest price match guarantee, 100% customer satisfaction guarantee, fast shipping within contiguous USA and fast production times will keep you covered. What does it takes to convert a duller marketing attempt into a full- fledged campaign? A kid-friendly approach and we mean it. Yes, you can easily strike cords with parents by offering them a gift that will be loved by their kids. Personalized balloons will easily become walking billboards for your business because your young recipients will do footwork to discuss your brand name! 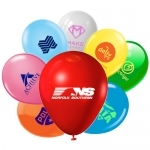 Whether you are a startup business or established corporation trying to increase customer base and enrollment, we suggest that you try these promotional balloons printed with your brand logo. You can gift these custom printed balloons for many occasions. It can be given as wedding favor gifts printed with your initials and date. You can use them as anniversary balloons, baby shower balloons, birthday balloons, wedding favor balloons, Bar Mitzvah and Bat Mitzvah balloons. You can also use these kid-friendly balloons to send as invitations or send along official invitations. Invitations printed on balloons will buy more attention than regular invitations. Imprinted balloons will help you to score with your potential customers coming with their kids to tradeshow booth. It is possible to order these balloons in bulk and save money on them. All our balloons are made to perform, so you can employ them on all those occasions when you want to appease kids. Being lightweight, you can stock them for long time and easily carry it wherever you want to bring it. 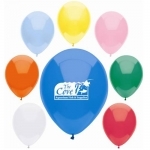 We can provide balloons in different sizes, colors and prices depending on your need. 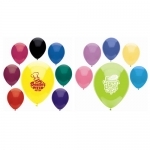 Most people select 9" balloons in basic and metallic colors to give along with goodie bags, return favor gifts, school spirit gifts and party gifts. 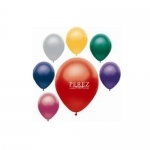 11" balloons in metallic and basic shades make large party decoration items and individual business gifts as well. Just imagine chuckles and smiles on the faces of kids upon receiving these custom printed balloons. Know more about business advantages of promotional balloons, perfect imprint options and price benefits by giving us a call today at 855-454-3786 between 8 AM - 6PM (Monday through Friday). You can even write to us at info@promo4kids.com.